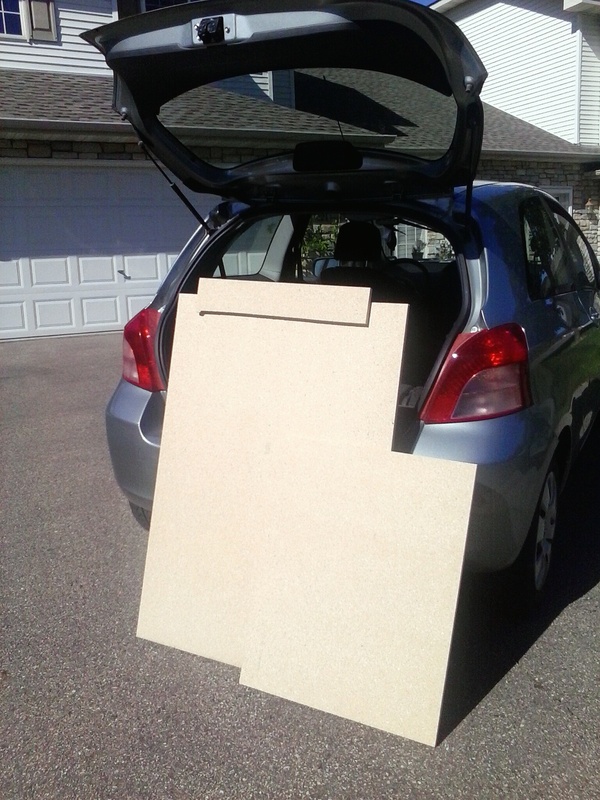 I’m turning my Yaris, which is a subcompact hatchback, into a camper. No, I’m not towing a camper behind it. The Mighty Yaris will be my camper. I’ll reveal why I’m doing something so crazy later. Suffice it to say turning such a small vehicle into a camper presents some challenges. Such as – even if you flip the back seats down, the back of the car is only 4 ft long. I’m short, but I’m not that short. First thing to do is measure the interior back of the car. 50 inches long and 48 inches wide – or thereabouts. Things like the wheels bump into the interior in places. The opening of the Yaris hatch isn’t that wide, it narrows down to just over 32 inches in the center but closer to 28 inches towards the floor. So what to do? My camper will have to have the hatch open and the sleeping platform will need to extend out the hatch and beyond the back bumper. I’ll make a car cover/tent to put over the car with mesh air vents where the car windows are and a zipper opening to exit out the hatch. This may not make much sense now, but will as the build progresses. Two pieces of sleeping platform, with support strip glued on. The sleeping platform is in 2 pieces. A 32 inch by 48 inch piece in the back of the car and a 24 inch by 30 inch piece to fold out of the car so I can extend my legs when I sleep. It can also serve as a table during the day while I’m camping. I bought the sheet of chip board at Home Depot because I know I can ask them to cut the wood pieces for me since our electric tools are still in storage. I have a hand saw and that’s ll work for the rest of what I need to do on the build. The sheet cost $20 and the wood glue cost $3.50. I have the scrap pieces in the garage and I’ll use them later. There’s a raised lip on the hatch opening of the Yaris, so I’ll glue a third strip of wood to the bottom of of the larger main piece of the platform so the platform lays level and is supported. Otherwise, when I fold the leg platform out, the hinges will rip off. I’ll need to find telescoping legs for additional support for the leg platform so if anyone knows a great place to find those, let me know. Tomorrow I’ll paint the two pieces and put the hinges on. Eventually there will be built in shelves, the tent/car cover to sew, and some style touches like a foam headboard and a window box that hangs off the leg support/table. I want something functional and adorable. Once the entire build is done, I’ll compile all the posts into one and then I can start documenting the adventures of the Mighty Yaris Micro-Camper. I used to have a Toyota RV and loved it. I have recently been fascinated by the tiny teardrop campers. I can’t wait to see what you come up with! Hi, i would like to see the final result of your project if possible!!! I lived in my hatchback for 6 months as well!